If you're just getting into watercolors or you've been painting for a while, sometimes it's fun to just experiment with techniques that you don't normally use when painting. I usually only paint using the basic watercolor techniques (see #1-#3) , but some of these are really fun to play around with, even if it's not for a final painting. I especially love playing around with experiments like this if I find myself at a loss for ideas or not wanting to sit down to paint any subject in particular! Creates a dry, textured look - especially on cold press and rough papers. Load brush with paint, but make sure your brush is not fully loaded and full of water. You may need to blot some of the extra moisture on a rag or paper towel before brushing on paper. I like to use the side of a round brush to get this effect! Creates soft blends, like you would see in clouds and base layers for landscapes. Apply clean water with a clean brush to the paper and look for an even sheen of water (not pools!). Load brush with pigment and paint on the areas where you applied water. Allow paint to dry, the results will look different (and more beautiful) after drying. Use this to remove or “lift” colors from areas where you want to lighten the paint. On dry areas where you've already applied paint, use a clean brush dampened with water and “scrub” these areas with water to lift the colors from the paper. On semi-wet areas where you've applied paint, use a clean, dry brush to "sponge" up the areas to lighten. Sprinkling salt onto wet paint creates interesting bursts or star textures. When paint is still wet, sprinkle kosher salt onto painting and allow to dry. After drying, scrape off the salt crystals. Use this to create irregular edges and interesting veining textures. Paint with pigment on paper, loosely putting down color - it could even been a couple pools of color on the page. Lay down plastic wrap over wet paint and smooth out with fingers, pushing paint to edges. Allow the paint to dry with the plastic wrap on top. Remove when dry. Plastic wrap is used in the opposite order for this technique and creates organic geometric textures. Paint colors as desired. Crumple up plastic wrap, lay it on top of paint, and allow to dry. Remove plastic wrap when dry. Alcohol pushes away paint and creates soft-edged white areas. Paint areas areas as desired. While paint is still wet, use a clean brush and dip in rubbing alcohol (Vodka works too!) and apply alcohol to painted areas to push away the paint. Use this technique to create organic, coral-like textures. Take a spray bottle with clean water and spray the paper. Load brush with pigment and dab the tip of the brush into wet areas and watch pigment spread. This approach creates a splatter texture on painted areas. Paint as desired, allow to dry partially (a few minutes), then use spray bottle with clean water to spray painted area. Careful not to overspray (too much water) - or splatters will not be as prominent. Use it to protect white areas of paintings. If using a brush to paint with masking fluid, prep an old brush by coating with a layer of dish soap (and make sure to wash after using). 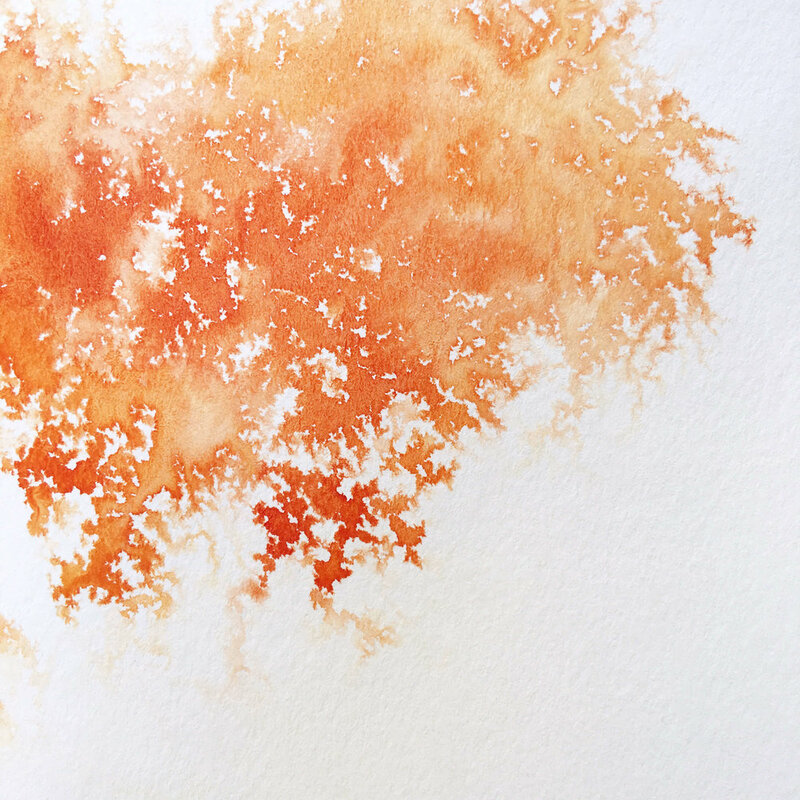 Paint areas you want to leave white with masking fluid. Wait until masking fluid is completely dry and paint over it with color. After paint has dried, masking fluid can be rubbed off using your fingers. I hope that these 10 techniques look fun and make you want to sit down for an experimenting session with your watercolors. One technique I've been wanting to explore more is using masking fluid! It's on my long list of "to-dos" and I hope to make some time to do that soon!